This week, I’m joining Jeff Goins for his . If you want to participate, sign up for the . Also, you might consider grabbing a copy of his book, . Jeff is such an inspiration to me as a writer and I highly recommend reading all of his books, if you have a chance! It’s fitting and convicting that . Because I totally bombed this one almost as soon as I woke up this morning. I usually wake up a good bit before my kids do and have quite a bit of quiet time to read, pray, and tackle business and blogging projects before everyone’s up and the day starts. But this morning, I woke up late and almost everyone was up soon after I was. Instead of quiet, there was interruption after interruption after interruption. I felt frazzled and frustrated… and then I saw that today’s challenge was all about embracing interruptions. Oops. After , I began again with new resolve. And I’m so glad I did. Embracing interruptions meant getting to hear some amazing news from a friend’s phone call, enjoying a game of baseball with Silas (his determination and focus brought me so much joy! ), watching Kathrynne do card tricks, watching Kaitlynn create, and laughing over a random inside joke with Jesse. How did you embrace interruptions today? Tell us in the comments or leave a link to your blog post about it! Looking for more? 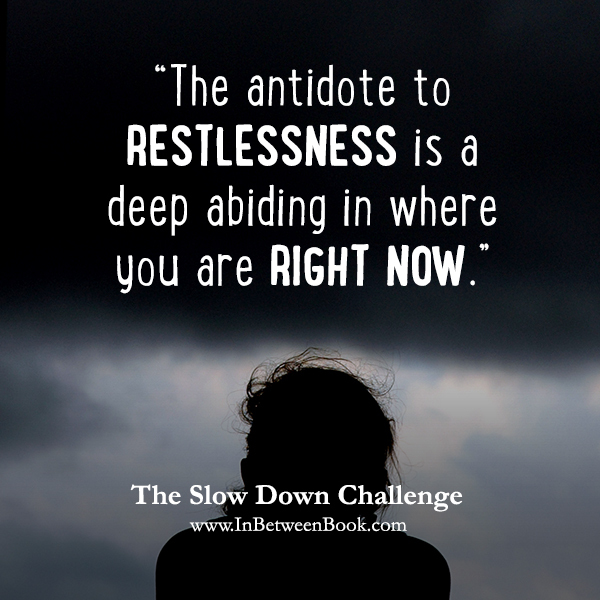 Read more posts about Slow Down Challenge. I had so much to do today and there was interruption after interruption at my house too. But like you when I decided to embrace the interruptions and the day turned out quite nice. Lots of stuff didn’t get done but the most important things, spending time with family was did. It was a good day, interruptions and all. I am horrible at embracing interruptions. I am such a stick to my agenda and routine type person. I fail at this probably daily. I always try to remind myself that ultimately as a christian it should not me “my agenda” but His and that “interruption” just might be His agenda for me today. Still very hard. be not me! that is what I get for multitasking. Writing comments while trying to do last minute preparations for a day at the zoo with the kids. I have my days and chores scheduled and really don’t like any interruptions to my routine. Today I am going over to my daughter’s to help make our grandson’s first birthday cake for his party tomorrow. Yes, I am happy to be doing that but I already feel off and frazzled with trying to make sure everything gets done ahead before I leave the house. I really need to let this go but it is hard! After I turned 50 it really got much more challenging to change things like this and I have to be much more vigilant not to think that it is okay to be stuck in my rut. Love your take on this, life really is what happens when we’re waiting for something better to come along. My family is growing up so fast and quickly leaving the nest, I’m really trying to see those interruptions as the main thing, rather than a sideshow. That’s where the good conversations happen, and when crises arise, that’s when you get to show your family (and friends) how much you care about them–enough to drop everything to help them out. My entire week has been an interruption. 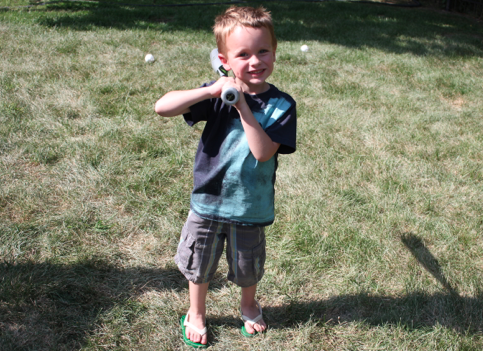 My son came down with a mystery illness that has made him miserable. Doctor’s visits, not napping, constant crying has meant that I’ve struggled to get anything done. My schedule is destroyed. It was initially annoying, but I’ve accepted it. These things happen. I’m currently watching him play with some yarn and egg cartons he found in my craft room, and for the first time all week, he’s happy, which means he’s feeling better. How could I *not* embrace that?! Embracing interruptions is one of my biggest challenges. It’s a continual struggle. I seem to deal with it one of two ways. Most often, I get really cranky and snippy with the person interrupting me. Sometimes, I can remember that it doesn’t matter that I’m getting interrupted and just breathe deeply. I need to have “embrace interruptions” tattooed on my palm. Oh, that sounds like the different between my husband and me. Very interesting thought! I just wanted to share a little of my story today. I love reading your blog. It inspires me and challenges me. So I got up this morning and started the busy day with reading this blog post along with the post from Jeff Goin’s on Interruptions. So about 1pm today I had about a 30 minute break before I needed to be at the next appointment. I decided I would run to the library to pick up a book I had on hold. I jumped out of my truck to hear my name being called from across the parking lot. It was a friend of mine who had her two small kids in tow. Her truck would not start, she was in tears and her husband was at work. My first thought was I have 10 minutes to get back to my appointment and then your blog post came to my mind. This was a God opportunity. I called the person I had the appointment with, told them I would be a little late and I focused on the situation at hand. I called my husband and we went into help mode to get them home and their truck to there house. God wanted to use me today through an interruption and because of your blog post I stopped and allowed him too. I walked away blessed also. Thank you for sharing with your readers! You inspire me to make the best out of my life everyday. That was beautiful — thank you so much for sharing! Your comment made my day! Although I didn’t get a chance to post yesterday, this challenge convicted me so much. I’m afraid that I don’t handle interruptions very well, but with God’s grace I’m trying! And the “funny” thing is, after reading Jeff’s post and praying for the grace to accept the interruptions the come my way, I had a lot of opportunities to practice. 🙂 The thing is, once I accepted the interruptions I became much less frustrated and still managed to get done what I needed to. I love that, Carol. I’ve discovered the same thing. Amazing, isn’t it?